The firm of MODULO MASTERPIECE, which made its debut in the EXA 2003 gun expo, is the italian branch of the swiss THOR firearms manufacturer. 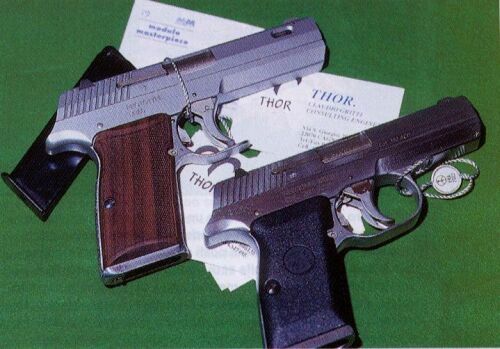 Since the famous italian firearms engineer ROBERTO TEPPA is now working for THOR, the firm has decided to bring back to life an old project of him: the small, compact, DAO "Resolver" pistol, luckless produced in the '80s. The MODULO MASTERPIECE version (you can see it in the picture compared with the original SITES design) is equipped with wooden grips instead of the original plastic one, with front strap and back strap, satin finish, and compensated barrel and slide, plus the front part of the trigger guard has been removed to allow easier reach of the trigger itself. It is by now made only in its original caliber, the .380-ACP (the versions in .9mm and .40-SW went out of the SITES factories in a few dozen exemplars during the '80s), however two .9mm versions are scheduled to be manufactured: the .9x19mm-Parabellum model will be made in Switzerland by THOR, while MODULO MASTERPIECE will produce the .9x21mm-IMI version in Italy.